Although the American singer-songwriter, dancer and choreographer only ever released three studio albums, during the late 80s and early 90s Paula Abdul was a highly successful music artist, and had eleven Top 40 hit singles in her home country. 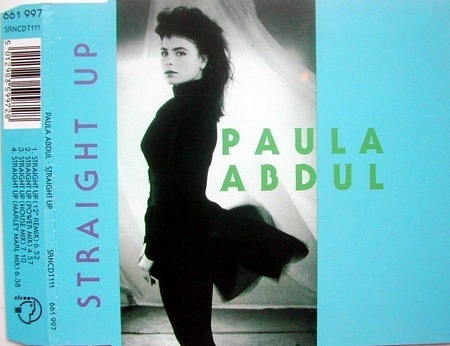 Straight Up was the third single from Paula Abdul's debut album Forever Your Girl. Released in November 1988, the R&B/dance tune topped the Billboard Hot 100 charts for three weeks in America, and also topped the charts in Canada. In the UK the song reached #3, making this the American singer's first Top 40 hit in the UK. Previous singles, Knocked Out and It's Just The Way That You Loved Me had failed to break into the Top 40. In the U.S., this was the first of six consecutive number one singles and became the fourth best-selling single of 1989, reaching Platinum sales. Straight Up reached the Top 20 before a video had even been created. Despite there being a rush to get a video out, the black and white video (choreographed by Paul Adbul herself) managed to win four MTV video music awards. From the late 90s, Paula Abdul conentrated more on her acting work and had roles in a number of movies including The Waiting Game, Mr Rock N' Roll: The Alan Freed Story and Touched By Evil. She also made a number of one-off appearances in a number of TV shows including Sabrina The Teenage Witch, The Wayans Bros and Less Than Perfect, to name but a few. More recently, she has been a judge on Live To Dance and the American version of The X Factor.